​Nicknamed “Coogs” after movie star Jackie Coogan, Gilbert Ashley’s bomber was shot down over North Korea on Jan. 29, 1953. 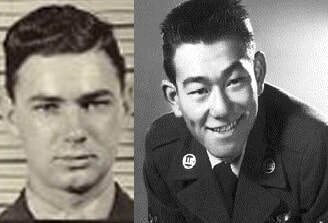 He and four crewmen -- Hidemaro Ishida (above), 1st Lt. Arthur Olsen, 2nd Lt. John Shaddick, and 1st Lt. Harold Turner -- were captured. Armed with this information, on July 28, 1953, the day after the Armistice Agreement was signed ending the fighting and requiring US POWs to be returned, US officers radioed Ashley. He was instructed to inform his North Korean captors that America knew he and his men were alive and the Communists should take them to a POW exchange point immediately to be returned home. “Communists cannot plausibly deny you are alive,” the US message said. The response came in early August. The captors threatened to kill their American prisoners. US officials with “intimate knowledge” of the operation declared the Ashley Five were alive as of August 1953, as other American POWs returned home. Ashley and his fellow crewmen were never returned or accounted for by North Korea. 영화 배우 재키 쿠건의 "쿠우가즈"의 애칭을 딴 길버트 애슐리의 폭탄 테러범이 1953년 1월 29일 북한을 향해 총격을 가했습니다. 그와 그의 승무원 4명이 체포되었습니다. 1953년 7월 28일 이러한 정보를 사용하여 휴전 협정이 끝난 후 미국 포로가 귀환되어야 하는 날에 미국 장교들은 애슐리에게 무선 연락을 했습니다. 그는 북한 억류자들에게 자신과 그의 부하들이 살아있다는 것을 미국은 알고있으므로 그들을 즉시 귀환시키기 위해 전쟁 포로 교환 장소로 데려가야 한다고 통보하도록 지시받았습니다. "공산주의자들은 당연히 살아있다는 것을 부정할 수 없었습니다"라고 미국은 입장을 전했습니다. 그 응답은 8월 초에 왔습니다. 억류자들은 미국인 수감자들을 살해하겠다고 위협했습니다. 해당 작전에 대해 "상세한 지식"을 가지고 있던 미국 당국자들은 다른 미국 포로들이 귀환한 1953년 8월 당시 애슐리 파이브가 살아있다고 선언했습니다. 북한은 애슐리와 그의 동료 승무원들을 절대 귀환시키지도 설명도 하지 않았습니다. "애슐리 파이브"에 대한 자세한 내용은 http://www.kpows.com/confirmedalivetheashleyfive.html에 방문바랍니다. The families of the “Ashley Five” wish to know what happened to their loved ones, confirmed alive and in North Korean hands after the end of the Korean War. "애슐리 파이브"의 가족들은 한국 전쟁이 끝난 후 살아있는 것으로 확인되어 북한이 장악하고 있는 그들의 사랑하는 이에게 무슨 일이 일어났는지 알고 싶어합니다.